All UK orders will be shipped either via the Hermes courier service or Royal Mail for which tracking details will be provided. 5 days to deliver within Europe and 5 to 7 days to deliver outside of Europe. Tracking details will be provided. 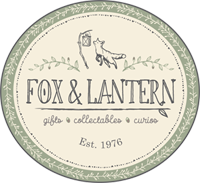 All products from Fox and Lantern are quality controlled before dispatch. If your item arrives and appears to have been damaged in the mail please contact me via the Contact Form and include images of the damage. If you are unhappy with the product(s) you've received please don't hesitate to get in touch. If you still wish to return the item please do so within 7 days, obtaining at least a Certificate of Posting from the Post Office. We will not cover the cost of return postage.